On a blustery day in mid-December, former Virginia governor and Washington and Lee University alumnus Linwood Holton drove the first spade into the ground for a downtown Roanoke park that will bear his name. Linwood Holton. Photo courtesy Wikimedia Commons. According to The Roanoke Times, a space formerly known as SunTrust Plaza will this spring be spiffed up and renamed Holton Plaza in honor of the Republican governor, who is remembered for dealing a blow to a segregationist Democratic machine led by U.S. Sen. Harry Byrd. Holton, now 93, retired and living in the Northern Neck of Virginia with his wife, Virginia “Jinks” Rogers Holton, graduated from W&L in 1944, then went on to earn a law degree from Harvard. By then, he had also served in the Pacific Theatre during World War II. He and his wife, a W&L trustee emerita, have four children, including former Virginia Secretary of Education Anne Holton, who is married to Virginia Senator and 2016 Democratic Vice Presidential nominee Tim Kaine. Washington and Lee gave Anne Holton an honorary degree in 2015. 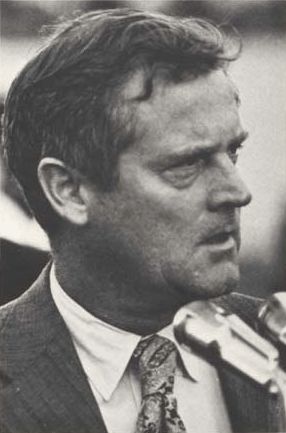 Holton, a Wise County native who settled in Roanoke after graduating from Harvard, was elected governor of Virginia in 1969 and served in that office until 1974. He spent much of that time fighting for racial integration and equality. In the midst of desegregation, Holton drew national attention by enrolling his daughter, Tayloe, in a formerly all-black school in Richmond. After it has been reconstructed, Holton Plaza will feature wall seating, trees, a pedestal and plaques dedicated to Holton’s career. The Roanoke Times reported that Holton showed up for the groundbreaking ceremony wearing a suit and tie and work boots, and carrying a pair of work gloves. He donned the gloves in order to dig the first hole for one of his favorite trees, a dogwood.